With the creation of Siri, Alexa, and Ok Google, voice search usage has drastically increased over the years. Throughout 2018, there were over a billion voice searches conducted per month. Reports last year even showed that 58% of consumers used voice search to find local business information. With this increase of voice search queries, your PPC strategy must adapt. 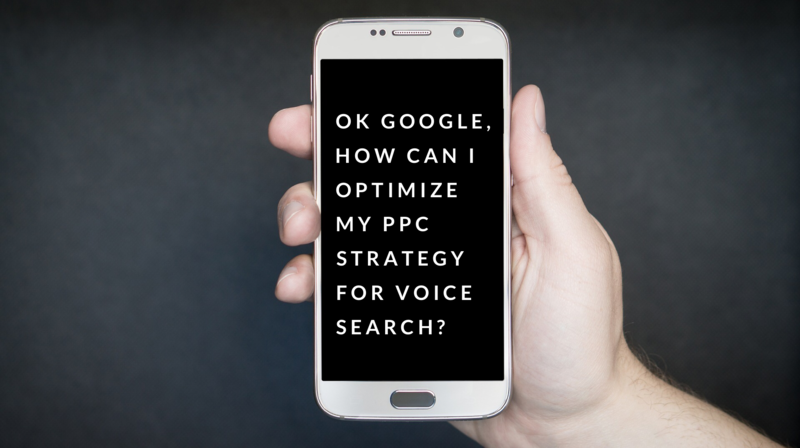 Below are four ways you can optimize your PPC strategy for voice search. To optimize your PPC campaigns for voice search, you should start by pulling your Google Ads Search Terms Report. You will want to download the report based on a 90-day window (for low-traffic accounts) and a 30-day window (for high traffic accounts). Once you pull the report, you should sort the keywords and look for the terms and phrases that utilize personal assistants. These will include but are not limited to, Ok Google, Hey Siri, and Alexa. Through sorting search terms by voice search assistants, you will be able to see which phrases are most leveraged by search engine users. In addition to sorting your Search Terms Report by personal voice assistant, you should also analyze the information for long tail search phrases. This will include any phrase that is six words or more. Voice search users, typically search in a conversational format as they are not typing directly into a platform. This conversational style creates longer search queries than those produced by individuals typing their query into the search engine. Once you have filtered these terms, as well as the personal assistant terms, you can add these into your current Google Ads campaigns. Voice search queries are more likely to incorporate questions due to their conversational style. With this in mind, your strategy needs to integrate question ad campaigns. The type of question terms utilized will vary based on your campaign goal. If you are running a brand awareness campaign, you will want to include “what,” “who,” and “why” questions. Searchers utilizing these question terms are showing interest but are not yet in the purchase phase of the buying cycle. These searchers are looking for information. If your campaign is to generate leads or conversions, you will want to include question terms such as “where” and “when.” Searchers utilizing these terms are at a further step in the buyer’s journey and have the intent to take action. By focusing your campaign on one of these question types, you will attract highly qualified leads for your campaign. The next step in creating your dedicated question ad campaigns is to create new ads and landing pages that include the answer to your question keywords. If you add this information in your ad and landing page, searchers will find your business more trustworthy and be more likely to click on your ad. When you provide them the answer to their question, they do not have to do further searching. This will help create a searcher’s desire to develop a relationship with your business. After you add your new question keywords to your Google Ads campaigns, you want to review your Search Terms Report for any potential negative keywords. If you are not looking to generate brand awareness, you will want to add “who,” “what,” and “why” question keywords as negatives. You will also want to remove any keywords that do not truly match your business. In addition to adding these negative keywords, you will also want to review your current negative keywords list. If you want to generate leads, you will want to make sure no question keywords, such as “where” and “when,” are in your current negative listing. You will also want to make sure you remove any terms such as “near me,” “where do I,” and “how to.” Many times these terms are associated with voice search queries. Lastly, you will want to make sure your Google My Business Listing is up-to-date. Through updating your listing information, you will have a greater chance of displaying in voice search results in regards to your business category and location. In addition to helping your PPC campaigns, your Google My Business Listing will also help your organic search results. With the increase in voice searches, you need to make sure you have optimized your campaigns. If you do not, you are missing out on potential customers, and your competition is already taking advantage of this. Why aren’t you? Posted by Alyssa Drewicz, Digital Analyst at initiate-it, a digital-first, full-service agency located in Richmond, VA.